Note : This Product name [ Shahnaz Husain Diamond Skin Revival Kit ] was changed and relaunched with new name " " [ ingredients are same as old one ]. Click here to view product with new name. 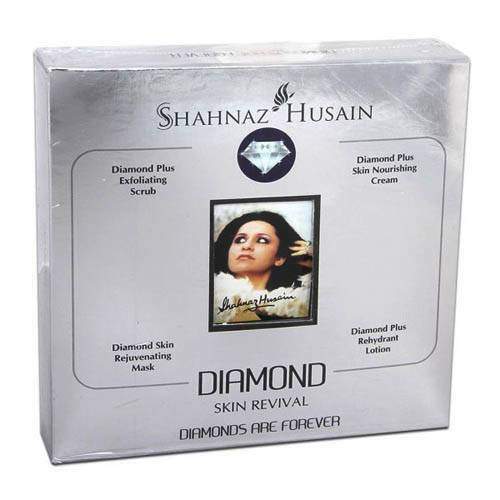 Shahnaz Husain Diamond Skin Revival Kit can be shipped to New Zealand [ NZ ] & Worldwide . Shahnaz Husain Diamond Skin Revival Kit - Express Shipping Transit Time of is 7 to 10 working days from the shipping date. Shahnaz Husain Diamond Skin Revival Kit Product Usually ships within 2 to 3 working days from India. The Shahnaz Diamond Skin Revival Kit is a powerful age control formula for timeless beauty. Diamond Skin Revival Kit has a powerful action, purifying and refining the skin. Shahnaz Husain Diamond Skin Revival Kit promotes the regeneration of new skin cells and enhances skin beauty. The Shahnaz Diamond Kit ensures healthy radiant skin. The ultimate in skin nourishment, the formulation is specially enhanced by advanced techniques. Ash of Diamond has been reinforced with organic extracts of vetiver, date, shea butter, tomato, olive oil and Vitamin-E to nourish and rejuvenate the skin powerfully. Diamond Plus Skin Nourishing Cream helps to strengthen the supportive tissues, improving skin elasticity and making the skin firm and supple. Shahnaz Diamond Skin Nourishing Cream Leaves the skin clear, radiant and youthful. A premium formulation for advanced skin care, Diamond Plus Exfoliating Scrub is a unique combination of ash of Diamond and organic extracts and oils. Diamond Plus Exfoliating Scrub is specially created to exfoliate the skin on face and body, it helps to remove dead epithelial cells and speed up the cell renewal process. Shahnaz Diamond Plus Exfoliating Scrub is enriched with almond, olive, coconut and apricot oils, along with cucumber seed, aloevera juice, lemon peel, date, vitamin-E and honey, the formulation cleanses, refines and revitalizes the skin, enhancing its youthful beauty and radiance. Diamond Plus Rehydrant Lotion is specially enhanced with organic extracts combined with ash of Diamond, the formulation provides intensive moisturisation and age control benefits. Shahnaz Diamond Plus Rehydrant Lotion contains extracts of carrot seed, date, basil, aloevera juice and grape fruit with Vitamin-E and honey, it helps to hydrate the skin powerfully and restore its smooth youthful beauty. Improves moisture retention and leaves the skin soft and glowing. Shahnaz Diamond Skin Rejuvenating Mask contains extract of massoorika and oil of orange, combined with Diamond Ash help to strengthen the skin supportive tissues. Diamond Skin Rejuvenating Mask increases vitality and delaying the formation of wrinkles and lines. Helps to enhance both health and beauty of the skin. Shahnaz Diamond Skin Rejuvenating Mask makes the skin appear firm and youthful. After cleansing gently rub Diamond Plus Exfoliating Scrub with circular movements. Wipe off with moist cotton wool. Massage with Diamond Plus Skin Nourishing Cream. Apply Diamond Skin Rejuvenating Mask for 15 20 minutes, wipe off. Apply Diamond Plus Rehydrant Lotion as moituriser on face. Shahnaz Husain Diamond Skin Revival Kit can be shipped to New Zealand & Worldwide . IndianProducts.Co.Nz Ships Shahnaz Husain Diamond Skin Revival Kit Usually within 2 to 3 working days. In our e-commerce online stores we have listed the best selling products of top Indian brands at comparatively Low prices including Shahnaz Husain branded Shahnaz Husain Diamond Skin Revival Kit . Browse our online stores in this shopping cart to get the products / items at Competitive pricing. Shop Shahnaz Husain Diamond Skin Revival Kit for yourself, or order as a gift to your loved ones. Shipped to any place in New Zealand ( NZ)& Worldwide. Free and Express International shipping available. IndianProducts.Co.Nz is a pioneered online shopping store for Worldwide Customers and today it is the one of the fastest growing shopping destinations for customers on the Internet with thousands of quality branded Indian ayurvedic & Herbal products list including Shahnaz Husain branded Shahnaz Husain Diamond Skin Revival Kit . As ecommerce evolves, sellers and buyers in are increasingly sophisticated and adventurous, demanding more choice. IndianProducts.Co.Nz offers Consumers the widest range of products and branded stores, along with the product information and necessary date to navigate & order / buy Shahnaz Husain Diamond Skin Revival Kit efficiently online. We are committed to delivering the world's ultimate shopping experience with high quality of service to the People of World Wide. We ships to Victoria , New South Wales , South Australia ( AU ) , Western Australia , Tasmania , Queensland , Northern Territory and Australian Capital Territory Transit Time of Shahnaz Husain Diamond Skin Revival Kit Pack Product from India to New Zealand ( NZ ) & Worldwide is 7 to 10 working days. After receipt of your product Shahnaz Husain Diamond Skin Revival Kit order with completed payment. We will send an order acknowledgement email. Our Executives will purchase the Shahnaz Husain Diamond Skin Revival Kit from the Product Distributor / Authorised Stores / Retail Mall. After shipping your ordered product Shahnaz Husain Diamond Skin Revival Kit we will send you an Products Shipped Email.